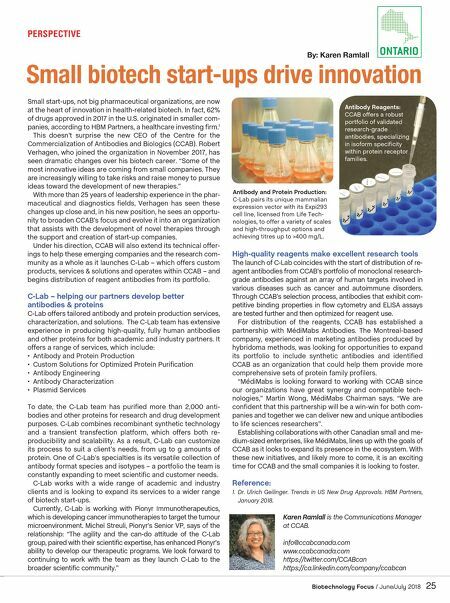 Biotechnology Focus / June/July 2018 25 ONTARIO PersPective Small biotech start-ups drive innovation By: Karen Ramlall small start-ups, not big pharmaceutical organizations, are now at the heart of innovation in health-related biotech. in fact, 62% of drugs approved in 2017 in the u.s. originated in smaller com- panies, according to hBm Partners, a healthcare investing firm. 1 this doesn't surprise the new ceo of the centre for the commercialization of antibodies and Biologics (ccaB). robert verhagen, who joined the organization in november 2017, has seen dramatic changes over his biotech career. "some of the most innovative ideas are coming from small companies. they are increasingly willing to take risks and raise money to pursue ideas toward the development of new therapies." With more than 25 years of leadership experience in the phar- maceutical and diagnostics fields, verhagen has seen these changes up close and, in his new position, he sees an opportu- nity to broaden ccaB's focus and evolve it into an organization that assists with the development of novel therapies through the support and creation of start-up companies. under his direction, CCAb will also extend its technical offer- ings to help these emerging companies and the research com- munity as a whole as it launches c-lab – which offers custom products, services & solutions and operates within ccaB – and begins distribution of reagent antibodies from its portfolio. C-Lab – helping our partners develop better antibodies & proteins c-lab offers tailored antibody and protein production services, characterization, and solutions. the C-Lab team has extensive experience in producing high-quality, fully human antibodies and other proteins for both academic and industry partners. it offers a range of services, which include: • Antibody and Protein Production • Custom Solutions for Optimized Protein Purification • Antibody Engineering • Antibody Characterization • Plasmid Services to date, the c-lab team has purified more than 2,000 anti- bodies and other proteins for research and drug development purposes. c-lab combines recombinant synthetic technology and a transient transfection platform, which offers both re- producibility and scalability. as a result, c-lab can customize its process to suit a client's needs, from ug to g amounts of protein. one of c-lab's specialties is its versatile collection of antibody format species and isotypes – a portfolio the team is constantly expanding to meet scientific and customer needs. c-lab works with a wide range of academic and industry clients and is looking to expand its services to a wider range of biotech start-ups. currently, c-lab is working with Pionyr immunotherapeutics, which is developing cancer immunotherapies to target the tumour microenvironment. michel streuli, Pionyr's senior vP, says of the relationship: "the agility and the can-do attitude of the c-lab group, paired with their scientific expertise, has enhanced Pionyr's ability to develop our therapeutic programs. We look forward to continuing to work with the team as they launch c-lab to the broader scientific community." High-quality reagents make excellent research tools the launch of c-lab coincides with the start of distribution of re- agent antibodies from ccaB's portfolio of monoclonal research- grade antibodies against an array of human targets involved in various diseases such as cancer and autoimmune disorders. through CCAb's selection process, antibodies that exhibit com- petitive binding properties in flow cytometry and elisa assays are tested further and then optimized for reagent use. for distribution of the reagents, ccaB has established a partnership with médimabs antibodies. 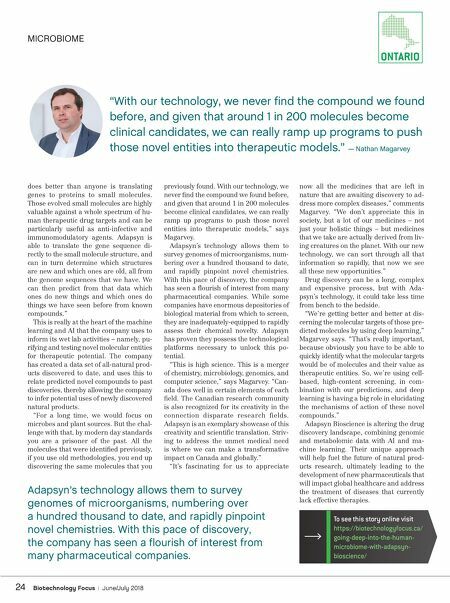 the montreal-based company, experienced in marketing antibodies produced by hybridoma methods, was looking for opportunities to expand its portfolio to include synthetic antibodies and identified ccaB as an organization that could help them provide more comprehensive sets of protein family profilers. "médimabs is looking forward to working with ccaB since our organizations have great synergy and compatible tech- nologies," martin Wong, médimabs Chairman says. "We are confident that this partnership will be a win-win for both com- panies and together we can deliver new and unique antibodies to life sciences researchers". establishing collaborations with other canadian small and me- dium-sized enterprises, like médimabs, lines up with the goals of CCAb as it looks to expand its presence in the ecosystem. With these new initiatives, and likely more to come, it is an exciting time for ccaB and the small companies it is looking to foster. Reference: 1. Dr. Ulrich Geilinger. Trends in US New Drug Approvals. HBM Partners, January 2018. Karen Ramlall is the Communications Manager at CCAB. info@ccabcanada.com www.ccabcanada.com https://twitter.com/CCABcan https://ca.linkedin.com/company/ccabcan Antibody and Protein Production: c-lab pairs its unique mammalian expression vector with its Expi293 cell line, licensed from life tech- nologies, to offer a variety of scales and high-throughput options and achieving titres up to >400 mg/l. Antibody Reagents: ccaB offers a robust portfolio of validated research-grade antibodies, specializing in isoform specificity within protein receptor families.